In the late 1830s French Canadians in the Oregon Territory petitioned the Quebec bishops to have missionary priests sent beyond the Rocky Mountains. In response to this plea, Fathers François-Norbert Blanchet and Modeste Demers were sent West to a remote part of the Quebec diocese referred to as New Caledonia by the Hudson’s Bay Company. While at Boat Encampment on the Columbia River (Mica Dam area), Blanchet and Demers celebrated Mass on October 10th 1838 ‑ the first Mass celebrated in what later became the Diocese of Nelson. 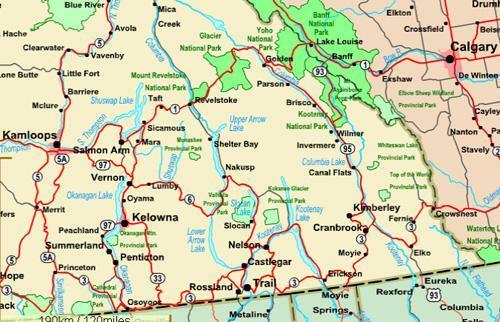 On February 22nd 1936, His Holiness Pope Pius XI erected the Diocese of Nelson to cover the Kootenay and Okanagan regions of southeastern British Columbia. This map shows the towns where parishes and missions of the diocese are located. For more information, contact the diocesan Archives. Our forefathers ... all passed through the sea.